Did anyone else use M&Ms or Smarties in their elementary school math classes? I think it was third grade when my teacher presented every student in the class with their own bag of M&Ms to illustrate simple lessons in percentages and probability. I'm not sure if it was effective, but it was a lot of fun. I still remember that most of the M&Ms in my bag were light brown (I'm dating myself here - this was before the blue M&M). There are five new flavors in this mix: Melon Berry Burst, Strawberry Lime Blast, Watermelon Green Apple Freeze, Cherry Tropicolada, and Mango Lemonade Freeze. I'm sure it's no accident that those names sound like they came straight off a Sonic Drive-in menu. 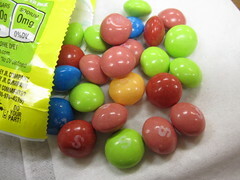 Now, I mention M&M math because I applied some of the same principles when I sampled this bag of Skittles Blenders. It was immediately apparent that my bag did not contain an even flavor distribution (Mango Lemonade Freeze in particular was underrepresented). Here's a chart to illustrate my point. Strawberry Lime Blast was similar to a normal red Skittle with a hint of sour lime. It was fruity, tart, and tasty, but it wasn't terribly exciting or special. Cherry Tropicolada reminded me of cough syrup. The pineapple and coconut flavors were present along with the strong cherry, but it really rubbed me the wrong way. Watermelon Green Apple Freeze worked well. The initial flavor was an artificial but tasty watermelon, followed by a green apple tartness. I'm not usually a fan of these flavors, but I liked them both here. Melon Berry Burst reminded me of grape Nerds, but with more of a blueberry flavor. I didn't get much of a sense of melon flavor from this one, and it seemed to just be a rehash of a flavor from Wild Berry Skittles. Mango Lemonade Freeze reminded me of my favorite smoothie (I've mentioned it before), so it was a bit nostalgic (especially since I just found out that shop is closed). The lemon flavor was sour and almost hit some floor cleaner notes, but it was saved by a good, distinct mango taste. Of all the flavors, this was the most unexpected. 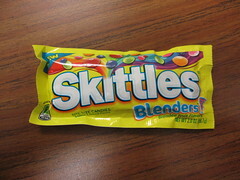 Overall, Skittles Blenders is a decent mix, but it didn't really offer anything new or exciting. Still, it's worth a taste for fans of Skittles and fruity candy in general. Also, it seems like every time I review Skittles, their website just gets more and more cumbersome to navigate. I guess I'm not the target demographic.